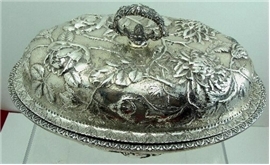 fabulous, ornate sterling silver covered vegetable dish with blossom flowers made by KIRK & Son CO. The condition is wonderful, albeit some minor impressions on the inside of the bottom bowl. The pattern is clear with nice oxidation. The length is roughly 11 1/2". The weight is 42 Troy Ounces. 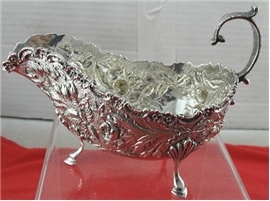 The handle is removable to allow the use of two serving dishes, if desired. There is a pretty monogram on the inside of the bottom dish. The hallmarks have been photo'd.